I’m getting excited thinking about our upcoming unit on American Artists! Every January and February we do six art projects, each focused on one artist per project. 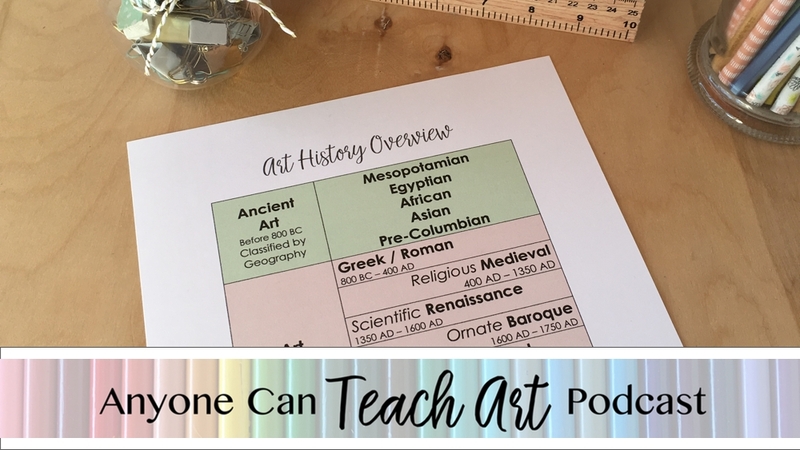 Studying these historical artists is such a fun way to incorporate a little art history into our homeschool week! It’s also a great introduction for the art history unit we’ll do in high school and it has been some of my favorite material to teach. However, every time I get to teach art history, I find myself a little disoriented with all the -isms and art periods. This year I am determined to finally gain a solid feel for art history. I’ve been reading books, watching videos, and taking notes. Now I want to share it with you. If you too feel a little bewildered or confused when the art history books mention Baroque, Neoclassical, Cubism or Surrealism, this is for you! I want you to feel confident teaching art and how art integrates with all the other subjects you teach. To do that, I believe we need to with the big picture of art history. To thank you for listening to our podcast, you’ll get a link to a free Norman Rockwell Christmas line drawing and some other holiday freebies! The freebies are only available until Jan 1st, so listen today and then tell your friends about the Anyone Can Teach Art podcast. To help you really internalize this big picture of art history, I’ve made an Art History Overview Chart for you. You can see it below and then download a higher resolution PDF of it. Print this chart so you have a nice copy to show your students as you pass along these ideas. I’ll refer to the chart throughout the podcast, but I’ll explain each section as I go because I don’t expect you to already have it downloaded prior to listening to this episode! Most art history books begin by talking about one particular type of art and discussing all its attributes, themes, and symbolism. 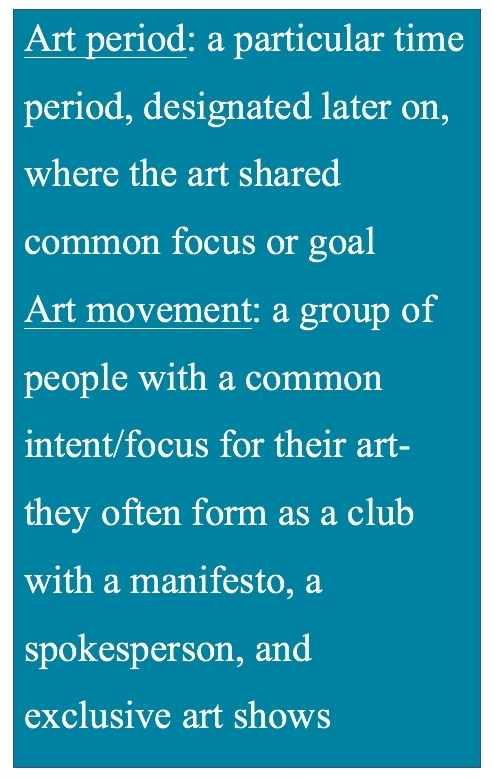 However, it’s easier to start with a big-picture framework for art history. Begin by thinking about art in these three main segments: Ancient Art, Art Periods, and Art Movements. Refer to the Art History Overview table, shown here, to help you form the framework in your mind as I explain each segment. I’ve never seen this particular breakdown in any books, but it’s been extremely helpful to me in learning about art history. On the Art History Overview Chart, ancient art occupies the top row. When thinking about art, think of “Ancient Art” as everything prior to the rise of Greece around 800 BC. While there was some culture-mixing and influencing prior to 800 BC, diverse cultures remained relatively secluded, resulting in each culture’s art usually having a distinct look and purpose. This is why we refer to ancient art by the specific geographic region of its origin instead of by a particular date range. For example, we refer to Mesopotamian, Egyptian, African, Asian, and Pre-Columbian (from the Americas) Art. 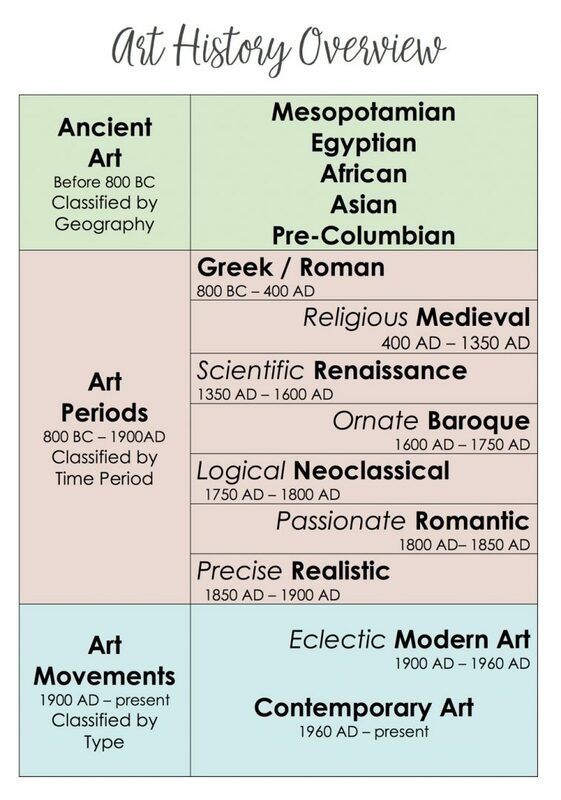 You can see these cultures written in the upper right green block of the Art History Overview Chart. On the Art History Overview Chart, Art Periods occupies the middle row. Around 800 AD the Greeks emerged from their dark age, borrowed the Phoenician alphabet and became a dominate cultural force in the Mediterranean World. They started colonizing cities around the Mediterranean and facilitating trade. As Greeks and people of other nations interacted with each other, continental trends in art began to emerge. For the next 2,700 years, there would be trans-national trends in art in the western world. Of course, each culture still had its own variety of the trend, but looking back, it’s easy to classify the art into time periods. In this section, we usually talk about the seven main art periods: Greek / Roman, Medieval, Renaissance, Baroque, Neoclassical, Romantic, and Realistic period of the arts. Each art period was a reaction against the previous one, swinging the pendulum back and forth between focusing on the concrete, measurable, natural world and the feelings and emotions of the abstract and eternal. This swing is represented on the Art History Overview Chart, with the art period appearing either on the left or right side of the column. In this way you can visualize which end of the spectrum each art periods falls. As time went by, these art periods got shorter and shorter, with the pendulum swinging faster and faster. By the Modern and Contemporary periods, art became so varied that time periods weren’t enough to describe what was happening, and we also began looking at movements created by various groups. On the Art History Overview Chart, Art Movements occupies the third row. In the 1800s art and culture started changing rapidly. The Industrial Revolution of the 1700s, the rise of the middle class, and the invention of photography turned culture on its head and gave art a bit of an identity crises. When the French Impressionists came on the scene in the 1860’s the art world splintered. The middle class loved the Impressionists but the Fine Art world thought Impressionist paintings were unfinished and unimpressive. The Impressionists formed their own club and had their own art shows. Suddenly the “gatekeepers” of art had lost their power and the world had access to all kinds of art. By 1900, we had Post-Impressionism, Pointillism, Art Nouveau, Early Expressionism, and Symbolism. Within a few more years, artists’ reactions to these movements and to world events gave us Cubism, Dada, Surrealism, Abstract Expressionism and many more art movements. We call this mix Modern Art. It’s another art period, but the art world frequently refers to the movements within Modern Art instead of grouping them all together as Modern Art. You don’t need to memorize the names of all these art movements to understand the overall trends in Modern arts. This was a time when most artists were determined to be unique and original. They were happy to break all the rules and create their own reality through expressive art. The Fine Art world tried their best to keep up with the chaotic modern art, however, most people didn’t identify with it and didn’t like it. So, there were also counter-trends (like Neo-classical, and Regionalism) in which artists were more interested in representing the real life they saw around them. In 1960, we saw a shift in art towards clean, simple lines and recognizable subjects. We call this time from 1960 to the present, Contemporary Art. Again, this is another “art period,” but we refer to the eclectic mix of art –isms more often than the umbrella of Contemporary Art. 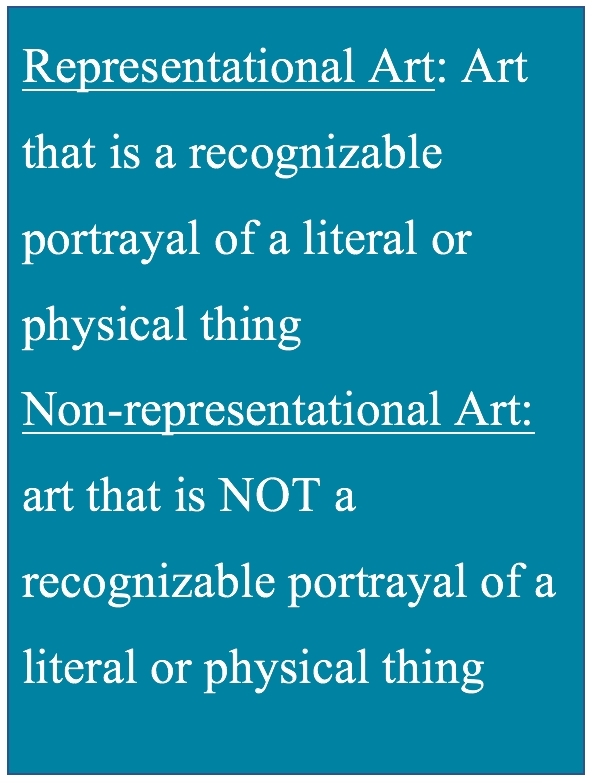 For example, you will frequently read about art movements like Pop Art, Minimalism, and Conceptual (imaginary) art. Without another 50 years of perspective it’s hard to summarize contemporary art, but with this big-picture framework for art, we can start learning more about the contemporary art movements and they will make more sense in context. There is so much more to say about all the different types of Modern and Contemporary art, but that will have to wait for another day. However, I must add this one thing since we’re studying American Artists this year: As you look at the big picture of art history, keep in mind that American Art in the 1900s did not fully convert to the Modern Art trends. Instead, there was a mix of artists: some kept the realist traditions alive while others embraced the individualistic, non-representational art. This is one of many exceptions that exist in art. This simplified framework will help you get a better grasp for the big picture of art, but you will find many exceptions and anomalies. Like all history, no simple framework can fully explain art history. However, having this framework has allowed my mind to sort, classify and retain the information. I hope it helps you too! I plan to go into each segment in a little more detail in my next podcast episode, but if you’d like to do some reading on your own, I recommend the following resources. They are where I’ve done my research. We’re giving away some great freebies to our podcast listeners! This week it’s a free line drawing of Norman Rockwell’s painting Santa and the Expense Book. Listen to this episode for details!